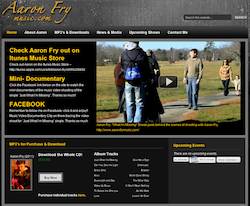 Just launched this week was our newest website www.AaronFryMusic.com. Aaron came to us with the hopes to have his first album integrated into a website for purchase and download. We were able to offer him a modern looking website with all of the features he requested: Event Management, Music Purchases, Music preview (60 sec clips), and Itunes Store creation with integration into the website as well as a blog for upcoming news for his music. The Connecticut WordPress Design includes a fully customized WordPress theme and options. The theme has been developed to showcases Aaron’s passion for music. It includes downloadable MP3’s via Paypal or the Itunes Store. The site also features an event management tool to display upcoming gigs Aaron will be performing at. Also included is a customized contact form for those interested in getting in touch with Aaron to book appointments. The website includes built in Connecticut SEO features. Any good SEO developed website needs to include a functional blog – yep this website includes a functional blog and is ready for internet marketing. We had a great time working with Aaron, and a lot went into this site to create the essence of Aaron’s music for his fans. If you are interested in checking out any upcoming gigs or just want to preview some of his music check out – http://www.aaronfrymusic.com/mp3s-and-downloads/. And as always – if you or your company is in need of quality and affordable web or WordPress Design, then contact us today.